Why is civic engagement and giving back so important to you? Christina: I’ve been involved with nonprofit efforts as long as I can remember… I grew up with the mentality that we help others because we can! This is something that has been instilled in my family. Having an impact in your community has been a big part of your life, what has that experience done for you personally? Christina: I found with my nonprofit experiences, not only did I get a lot of great life skills, but also skills that applied to my career. I found a lot of fulfillment doing this kind of work and that’s why I’ve done it throughout my whole life. What was your first experience with a non-profit? We have to know… did you get a chance to eat the gingerbread? It sounds like you’ve had an incredible experience with Habitat, did you feel that this was the time for you to try something different in civic engagement? Christina: Leaving college I was left in this fork in the road, I could continue with Habitat, or I could get involved with another nonprofit and learn a different side with multiple angles. When it comes down to it, what intrinsically fascinates me is the interconnectivity of all of these issues and how to eliminate big problems by tracing back to the issue of the root cause such as poverty alleviation. How did you get involved with the Patachou Foundation? Christina: Coming to Indy, I wanted to reframe the question and think about how I could eliminate poverty in a sustainable manner by meeting people’s immediate needs, rather than building them a long-term investment, like Habitat. I got connected with the Patachou Foundation and was asked to be an ambassador for them. I’m one of 20 total people for the year who is tasked with raising $7,000 for the organization. Christina: The Patachou Foundation operates under the idea that no child should go to bed hungry in our city under our watch – I love the way that is framed. I feel that it not only frames the problem that everyone can agree with, but it frames the fact that this is a pertinent issue where we are, this isn’t something happening overseas, this isn’t something that is happening in a different part of the nation.This is something happening in our backyard and it is a call to action at the same time. The Patachou Foundation also brings in global varieties of food to add an educational component to the program. They are expanding what food can be and how it can look different across the world. Raising $7,000 isn’t an easy task, how do you plan on making this dream a reality? 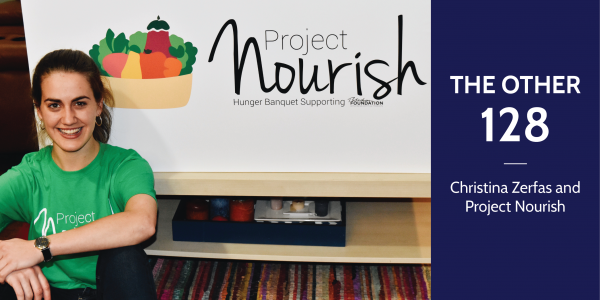 Christina: With my background, I have done a ton of fundraising and have done it “piece by piece” but I wanted to challenge myself professionally as well to try and do this all-in-one event – so I crafted the idea of Project Nourish. We will work to raise all of the money in a single evening, gala-style – so the event will have a silent and live auction and a banquet. Why $7,000? Is there any significance to that number? Christina: The $7,000 number is chosen because it will feed the children at IPS 54 one day per week for the whole year. But this school has a 3 day after school program – therefore they actually need $21,000 to run their program for the full school year. So I am committed to raising $7,000 but our goal is $21,000. Can you share how the event will transpire? Christina: I wanted to take this opportunity to host an engaging event. Instead of doing a traditional banquet, we decided to pull in the hunger banquet concept. This is a ticketed event, people are paying $45 to come to this event and we are not promoting exactly what the hunger banquet is per say, we are just publicizing that we are a hunger banquet and letting people interpret it as they will. When they walk in the door they will have been randomly assigned an income class and served accordingly. We are basing this all on hunger statistics in Indianapolis and dividing up the attendees in that regard. There will be 3 different tiers, the lower class, the middle class, and the upper class. Will each course will be prepared differently for the different income classes? Christina: The people in the lowest income bracket will actually get a Patachou Foundation meal, the people in the middle bracket will be served family style something middle of the road pizza and salad. People in the upper class will be served tablecloths and a three-course meal and they will have waiters and waitresses that will come and refill their glass. Everyone will be sitting in the same room as each other, so it will be very visible to see how everyone is being served. Hopefully, this will be an exercise in empathy and a little bit of a social experiment. Christina: The fellowship is so eager to give back and I hope this continues that trend. I hope this project encourages more initiative to start your own projects that don’t have to always be tied into Orr, using some entrepreneurial spirit. I really want people to take away encouragement to do their own things and to dig outside of the Orr Fellowship to find their passion as well. As impressive as you are, I know that you could not have done this by yourself, have you had help along the way? Christina: None of this would have happened if I was a party of one. I have such an impressive team. There are 16 people on my team 14 of them are Orr Fellows. They are just repeatedly impressing me. They have made this process so much fun! What efforts have gone into fundraising? Christina: The Orr network has been a game changer! We are approaching this 3 ways- Ticket sales, sponsorships, and straight donations. We have 3 tiers of sponsorships. A lot of companies can sponsor a table for $500 and they get their logo on it and they can bring people to the event. There is a $1000 table where their logo goes on the website, we promote them during the event. We will have 9 sponsors for the event! What can we do to support Project Nourish and the Patachou Foundation? Christina: There are two main ways that we can really use support. Any donations are always appreciated and always help the cause. Any amount helps, the meals are $5 so even a $5 donation goes a long way. The other way is just to promote the Patachou Foundation itself and the ambassadors program so any type of sharing of the website is greatly appreciated! Christina, your passion and enthusiasm are contagious, you’re truly making the Orr Fellowship and Indianapolis better! Christina: I’m all about hoping that people dream big and bigger!